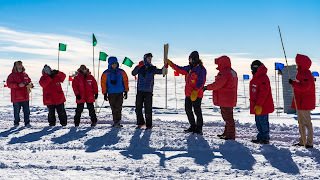 Just Another Travel and Science Blog: A New Year At The South Pole! Happy New Year! The past week has been very busy and interesting. Unlike Christmas, we actually had to work over the New Years weekend. On most holidays, we are generally not very busy, but over the New Year, we have to update hardware in the detector to take account of the leap second. That's right. I am sure many of you have heard of the leap seconds added at the end of some years and wondered why we actually have it and who really cares. Well, as it turns out, we care! This shouldn't be a problem, but the GPS clocks we use have a bug in the firmware that causes extra leap seconds to be added at the wrong time. Our responsibility is then to reset the clocks so they are running with the correct time. The up side to all of this is that it all happens at midnight UTC, which is about 1pm NZDT which is the time we use here on the station. That being said, we started the correction work a day early. In the process of discussing the plans, it was suggested that we fix some of our backup power on one of our clocks, which required re-cabling things and moving a UPS around. No problem, just flip off the system, and move the UPS and re-cable. Easy. Except... someone had already tried to re-cable things, but the wrong way. When we pulled the plug, it was to the wrong system. Long story short, we ended up taking the detector down for a couple hours while we waited for the GPS clocks to re-sync themselves. So we spent our New Years Eve afternoon moving around hardware and re-cabling and trying to get the detector back up and running. 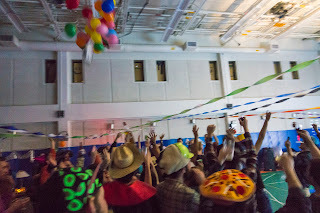 After that, though, things calmed down quite a bit. We even had a New Years Eve party in our gym! As bad as it was trying to deal with the GPS clocks, it was still pretty awesome to celebrate the new year at the South Pole... Though I am pretty sure they didn't take the leap second into account during the countdown at midnight! On New Years Day, things went much smoother. The final leap second procedure didn't give us a problem, and everything kept running just like we hoped. 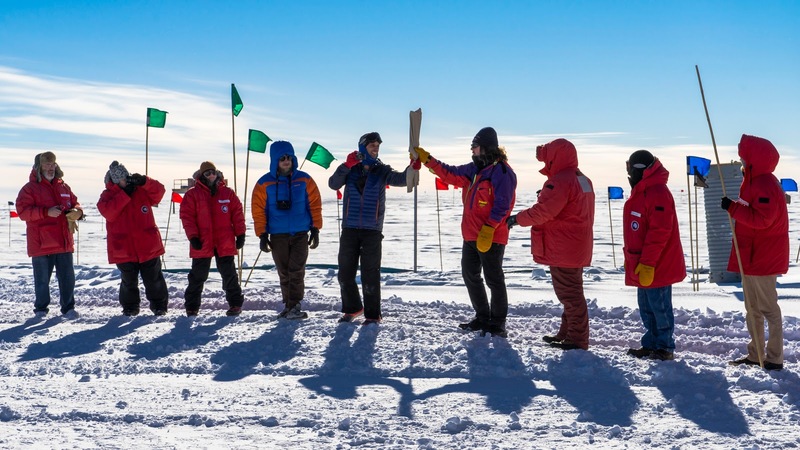 On the evening on New Years Day, we had a special ceremony where the geographical South Pole marker was updated. There are actually two South Pole markers here. One is ceremonial, which is used more for ceremonies and some fun pictures. The other actually marks where the current location of the geographic South Pole is. Because we are on a big sheet of ice that is moving, albeit slowly at 10 meters a year, every year the marker is relocated to reflect the new location of the South Pole relative to the station. The marker is relocated during a small ceremony on January 1st. A ton of people came out to watch and even participate. The new marker was designed by last years winterovers and built here on station. Ever year there is a competition for the next design, and we as winterovers can submit designs for the next marker. After the wining design is chosen, the marker is made and then concealed until it takes it's place for the next year. During the ceremony they touched the new marker, still covered, to the old one and then passed the marker around for everyone to hold until it reached the new marker location at the very bottom of the earth. It was a simple ceremony, but lots of fun. The other interesting thing going on right now is with our airplanes. We are very isolated here. Almost everything we have here comes in by airplane. Specifically, there are large Herc's flown by the New York Air Guard. The problem is that they are way behind on flights. Right now, we have had roughly 29 flights or so. The number of flights we should have had is around double that. It isn't a huge deal, except they are supposed to be bringing in fuel to keep us supplied throughout the winter. We also haven't really received much mail in about 2 or 3 weeks, and I am really looking forward to getting some of the things I have ordered online for the winter. It also makes it difficult for Martin, my IceCube winterover colleague, to take his R&R week off in McMurdo. (I opted out of R&R because it is too much of a hassle to deal with McMurdo. Though, he is optimistic that he will see penguins, and I think that would make it worth it to some degree. ) The funny thing is that because we are so behind on flights, they scheduled 19 for this week... That's right, we have had 29 in the past two months, and they said they would have 19 this week alone! So, you may think, "wow, you guys are going to be so busy with all of those flights!" Well, it is now Tuesday evening, and of those 19 flights we have a received a grand total of.... wait for it.... ZERO. We have also been told that there will be no flights tomorrow because the planes are all stuck in New Zealand due to weather. I guess when they scheduled the 19 flights, they didn't think the planes would actually have to be on the same continent to fly them. It is also surprising how many times the planes seem to have mechanical problems on days when there is a big football game going on... I'm sure that is just a coincidence, though. All that being said, I can't really complain that much. I am still really enjoying my time here. Things were slow today so I went and tried to play my trumpet. It turns out that I am going to have to spend some time working on easy stuff until my embouchure is built up enough again to do anything really complex. That is what I get for not playing much over the past few years! I am also hoping to get on the violin soon. I have all these hobbies that I am super excited about being able to get back into over the next year. Everything from music to books to electronics and even to some physics I want to study. Now that things are slowing down here, I am really looking forward to getting started! New Years Eve party at the South Pole! 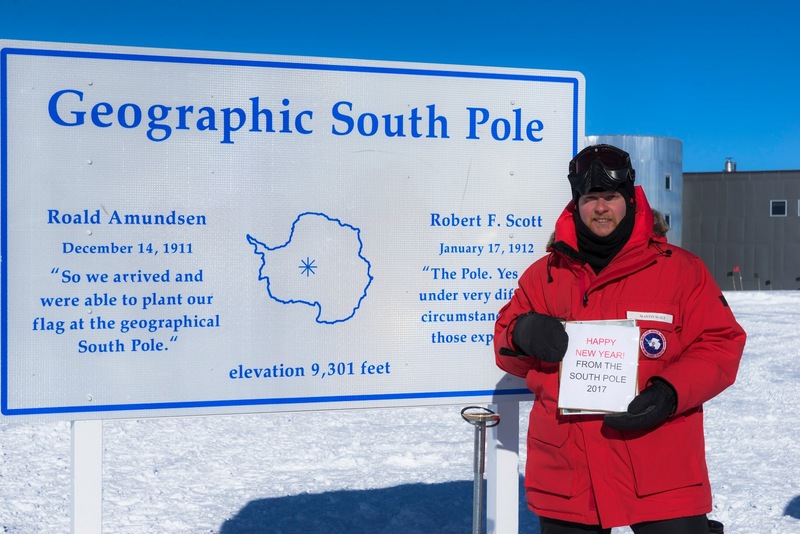 Wayne, our winter site manager, is getting ready to place the new South Pole marker. Everyone worked together to move the flag and the sign for the marker. This amazing pic was taken by Martin who happens to be a far better photographer than I am! 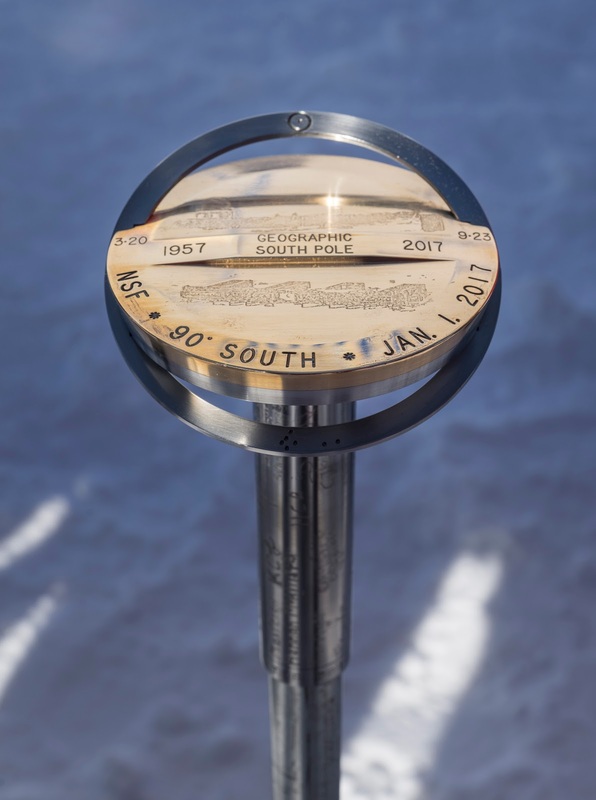 The marker was passed from person to person starting at the old marker and ending at the very bottom of the world at the geographic South Pole! This was also taken by Martin. 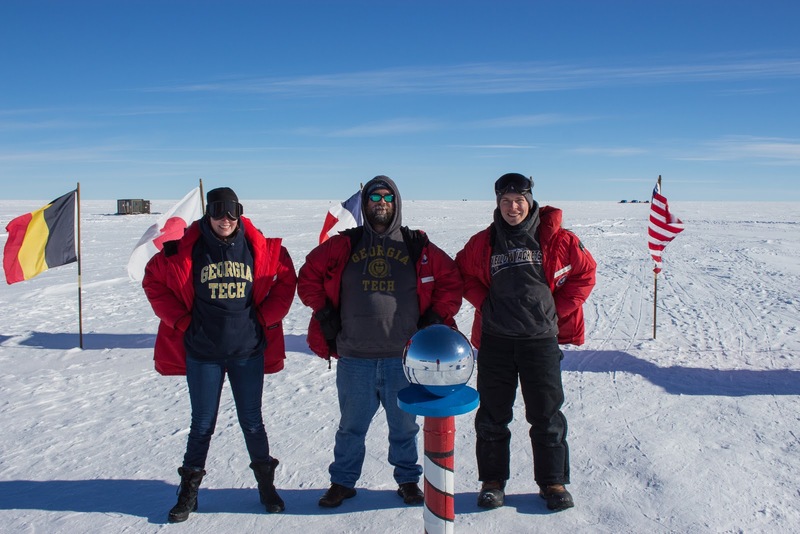 Two other Georgia Tech Alumns (Nicole and Adam) and I pose at the geographic South Pole in front of the new South Pole marker. 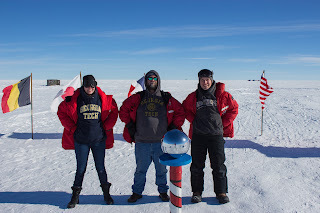 Adam, Nicole, and I also got a pic in front of the ceremonial South Pole! Here is Martin wishing everyone a happy New Year from the geographic South Pole! The is a close up of the marker. This was also taken by Martin! Yay I love this, thank you for sharing. It's well-written to the point I even hear your voice when I read it in my head :) I miss you! I'm glad you are having fun. So glamorous! Candio: Thanks! I am glad you enjoyed it. I miss you too! 1946Oberon: They did some work on the rodwell last week, I think. I didn't get involved, but we all did have to limit our water usage. While they are working on the water, we have rationed water. We don't ration drinking water, though, we just limit our showers and laundry and use disposable dish-ware.